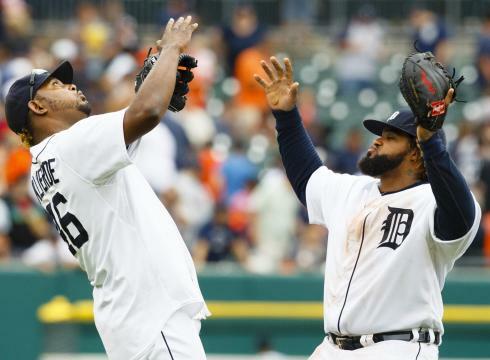 We may finally be getting an idea of how good the 2012 Detroit Tigers can be. After carrying a five-game winning streak into the All Star Break, the Tigers now have won thirteen of their last fifteen. The current run includes taking two of three in Baltimore and three of four at home against the Angels. Most recently, it includes a series sweep of division rival Chicago, putting Detroit a game and a half into first place in the division. And there was much rejoicing. While everyone would acknowledge there’s still plenty of room for improvement, the team finally is clicking on both sides of the plate at the same time, scoring an average of five and two-thirds runs per game while surrendering just three and a half. If not for a heart-breaking loss to the Orioles in the thirteenth inning and a 13-0 destruction of now-traded youngster Jacob Turner at the hands of the Angels, Detroit would’ve been riding a fifteen game winning streak. More than anything (and “anything” includes Miguel Cabrera’s 300th career homer), it feels good to see this team climb the mountaintop and get into first place. They’ll have to fight to stay there, but so long as Austin Jackson keeps sparking two-out rallies and the bottom of the order keeps hitting multi-run home runs, I think they’ll be able to handle it. Onto the news of the night: the Tigers traded Turner and two prospects to the Marlins in order to address their perceived needs: another starting pitcher and a new face at second base. In return, they get second baseman Omar Infante and Anibal Sanches, RHP. My instant analysis of this trade is going to be brief, because I’ve got to be straight with you: I haven’t exactly heard of either of these guys. Turner, I had a strong feeling, was going to be gone. The bad outing against the Angels was a problem not so much because the team lost but because it may have damaged his trade value. Luckily he bounced back to win a series-sweeping game against Chicago yesterday. His prize? An all-expense-paid trip to Miami. Infante is hitting .287, 8 HR, 33 RBI, while Sanchez is 5-7 with a 3.94 ERA. My somewhat less instant analysis (given the time taken to type this much) is that I’m not sure Sanchez looks a lot better than a reasonable or slightly optimistic projection of Turner. Infante is replacing primary second baseman Ramon Santiago, who’s hitting .216 this season, so those few ticks up should be helpful, especially slotted within a loaded lineup. The initial Free Press report indicates that this move probably signals farewell to Ryan Rayburn and Drew Smyly. Rayburn has been underperforming for some time. Smyly, though, has been having a good year considering his circumstances (being thrust into a starter position at a young age). I’ll conclude my bare-bones analysis of this trade by observing the fact that two-thirds of Free Press readers currently disapprove of it, according to a poll on the site. This entry was posted in ALDLAND and tagged austin jackson, chicago, detroit, jacob turner, marlins, miguel cabrera, mlb, tigers, white sox by AD. Bookmark the permalink.